Our goal was to bring attendees more than what they might find on Google and offer real, actionable tips from practitioners who are experimenting and implementing adaptive learning. In this post, I’ll shine light on some of the interesting discussion points. For the full experience, you should access the recording here, Getting Started with Adaptive Learning Webinar Recording. A commonly cited metric in the press is to drive greater course completion. However, Olivier Le Gouanvic, Engineering Manager at France Université Numérique, states that he’d like to use adaptive learning to “facilitate lasting memorization of material”. This moves the conversation to a more interesting metric that relates to the learner rather than the course. Additional learner centric metrics discussed included reducing time to reach competency for a given topic and improved assessment scores. Adaptive learning experiences rely heavily on content, particularly content that is developed with adaptivity in mind. Many new courses will attempt to leverage existing content, but this isn’t always as useful as practitioners initially think. Specifically, existing offline and online content is linear in nature. Much of the existing content is long form and constructed in a linear progression. This poses two problems. The first is modularity. Adaptive learning needs small modular pieces of content. This requires organizations to spend time and money "cutting up" their content and rewriting it so it is not so dependent on consuming large chunks (i.e. not readily adaptable) of content. This adds cost, time, and complexity to projects. Second is linearity. Adaptive requires a learner to be able to jump around a knowledge graph which is not something existing content is designed for. These two items further the need for content massaging or greenfield content. “Most courses today are not designed with adaptivity in mind so you have to retroactively apply a structure and metadata that does support adaptive and...the cost of this effort could be prohibitive for many courses”, says Scott Dunn, Director of Engineering for Teaching and learning edX. There is great promise for adaptive learning; however, as our panelists discussed, it is important to ground these expectations for the future with realities of today. Stakeholders might imagine an adaptive experience as capable as a supersonic jet while the technology can only support the equivalent of a 1920s biplane. To counteract this, as Furqan Nazeeri, Partner of ExtensionEngine states, “think about learning goals and outcomes first, then adaptive and any other toolset.” With this order in mind, you’ll stay in the realm of practical and only take on new technology when it can drive pedagogy. 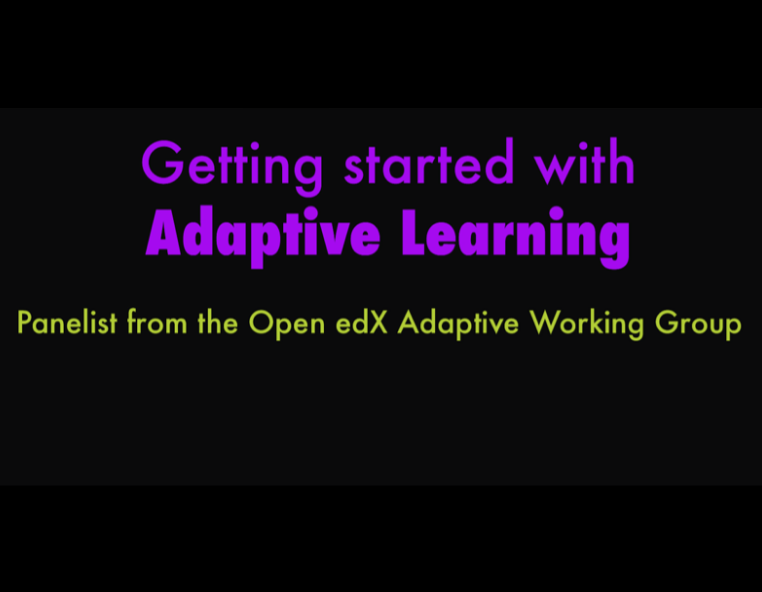 That’s it for the highlights, for the full experience you should access the recording here,Getting Started with Adaptive Learning Webinar Recording. Stay tuned for more updates from ExtensionEngine pertaining to adaptive learning and the open edX Adaptive Working Group. In launching 70+ online programs for 40+ institutions in the last 18 months, we created an approach to learning unlike any other. We call it custom learning experiences. It's helped exceptional universities, corporations and non-profits deliver innovative online and blended learning experiences. Why custom learning experiences? Elite institutions looking to offer unique and engaging learning experiences often struggle with what to do because solutions offered by most LMS and OPM vendors are undifferentiated, antiquated, boring or require expensive revenue sharing. Custom learning experiences leverage the latest techniques in learning science and advances in technology that involve the learner, get them to collaborate, get them to act, thereby resulting in true learning. It creates a learning environment that is not bounded by off-the-shelf technologies or dated courses. With a staff of over 200 experts, we help our clients with each aspect of building a custom learning experience, including project management, instructional design, UX/UI, development/QA, hosting/support and learner acquisition services. We operate on a fee-for-service basis, meaning the IP and revenue are yours to keep.